Elida’s Daniel Unruh drives against Lima Senior’s Jermaine Daniel during Saturday night’s game at Lima Senior. Find game summaries, photo galleries and more at LimaScores.com. Lima Senior’s Cory Clair puts up a shot against Elida’s Donte Johnson during Saturday night’s game at Lima Senior. Lima Senior’s Cory Clair puts up a shot against Elida’s Skyler Smith, left, and Isaac McAdams during Saturday night’s game at Lima Senior. Elida’s Isaac McAdams has his shot blocked by Lima Senior’s Cory Clair during Saturday night’s game at Lima Senior. LIMA — Lima Senior threw waves of pressure at Elida. But when Elida needed it the most, the Bulldogs found a way to beat the press. 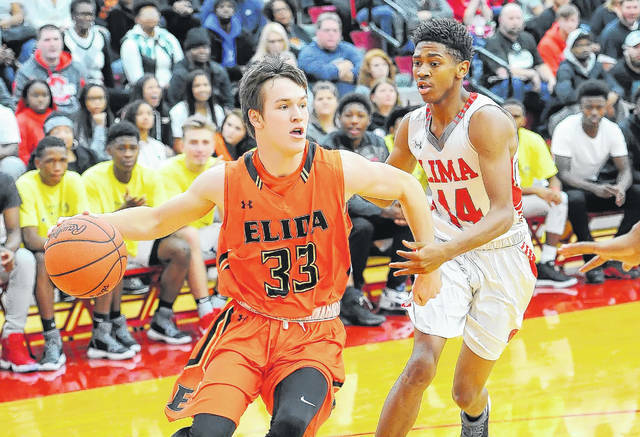 Elida built up a nine-point lead in the fourth quarter, then held on for a 55-54 boys basketball victory over Lima Senior Saturday at Lima Senior. Elida is 9-0. Lima Senior is 5-5. Elida had 16 turnovers, but broke the press when it had to early in the final quarter. McAdams scored 11 points in the final quarter, including many after the Bulldogs weaved their way through the press. 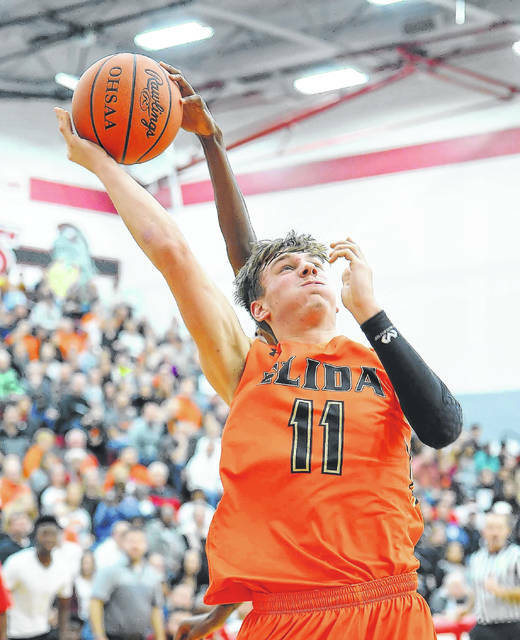 McAdams led Elida with 22 points. Donte Johnson had 16 points and 10 rebounds. Daniel Unruh was in charge of breaking the press and had 14 points and seven rebounds. 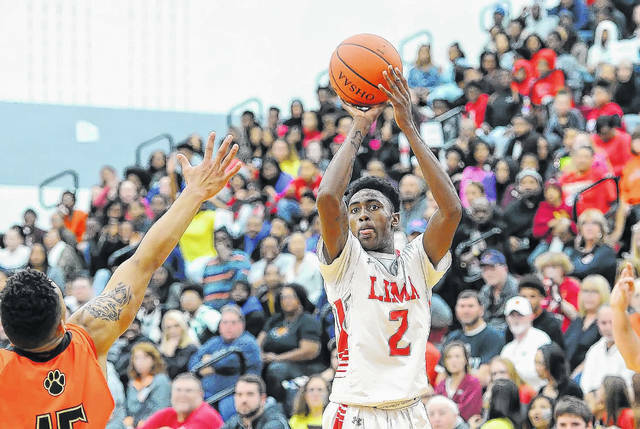 Jaleel King had 24 points and 17 rebounds for Lima Senior. Greg Johnson and Jermaine Daniel both scored eight. Jatsiel Colon, a 6-foot-8 senior, had four points with 14 rebounds. Lima Senior won the boards, 49-33. Elida led 33-32 after three quarters, then with a few layups off the press breaker, built its lead to 47-38 with 2:48 to go. Skyler Smith gave Elida the lead to stay 38-36 with a 3-pointer with 6:40 to go. Back came the Spartans behind King, who scored 15 in the final quarter. King’s free throw with nine seconds left got Lima Senior within 54-51. Johnson’s free throw for Elida made it 55-51 with five seconds to go. King sank a long 3-pointer just before the buzzer to make it 55-54. 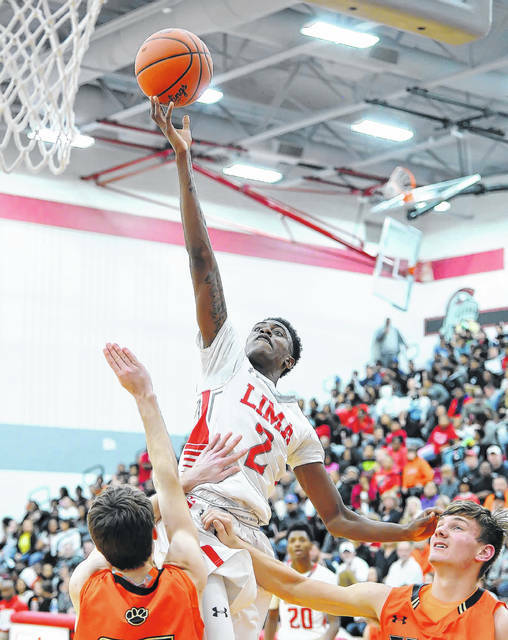 Lima Senior was playing without guard B.J. Miller (coach’s decision). It was also missing because of injuries Jaleel Long and Jainaz Cameron. The first half was plenty of physical, but neither team shot well. Elida led 11-9 after the first quarter and 19-18 at the half. This entry was tagged Elida, limasenior. Bookmark the permalink.